Because “every child is worth it,” we extend our programs and services to many individuals, groups and organizations in an effort to help promote the sport and activity of jump rope. We accomplish this through workshops, outreach programs, special events and performances. The program annually hosts the North Carolina Rope Skipping Workshop, which will be celebrating its 28th year this November in Chapel Hill, North Carolina. 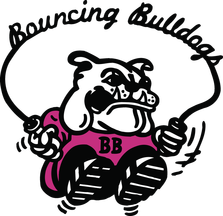 The Bouncing Bulldogs teach and perform worldwide for thousands of people including sports fans, health and fitness professionals, corporate employees, students, educators and the general public. Bouncing Bulldogs team members have taught and performed in Australia, Belgium, Bermuda, Canada, Cayman Islands, Costa Rica, Denmark, England, France, Germany, Greece, Israel, Japan, Portugal, South Africa, Spain, Sweden, the Virgin Islands, and many of the states within the United States of America. Check out our workshops, programs, events and see if there is something that you would like to jump into.